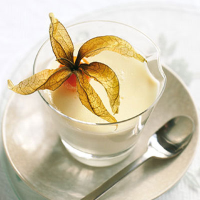 This produces a slightly more softly set posset than cow's cream generally does, and its delicate tang is delightful. Pour into small glasses or ramekins and chill for about 4 hours (or overnight) until set. Decorate with a sprig of mint and serve chilled. The Corker recommends: The delicacy of sweet wines from the Loire is perfect for the almost savoury edge in goat's cream.